The Theodore Payne Native Plant Garden Tour is a unique adventure: a two-day self-guided journey through 35 or more of the Los Angeles region’s most beautiful and inspiring home landscapes. At each location, you’ll meet garden owners, designers, knowledgeable docents and fellow gardeners. The gardens are divided into two groups—one group open Saturday, April 6, and a second group open Sunday, April 7, 2013. Tour hours are 10:00 a.m. to 5:00 p.m. each day. Saturday gardens are located inland, with destinations in the San Fernando and San Gabriel valleys and around downtown L.A., along with one high-elevation garden in Acton (near the Antelope Valley). Sunday gardens are primarily on the Westside, with locations from Santa Monica to the South Bay, with two stops in Oxford Square (near West Adams). See the complete list of gardens for an overview of features, including slopes, edibles, recycled hardscape materials, child-friendly design, and more. Tour tickets are available in our online store, by phone at (818) 768-1802, or at our Sun Valley headquarters. Each ticket includes admission for a single visitor to all gardens across both days, and a printed color guide with addresses and driving directions. The tour is self-guided so you can make your own itinerary and go at your own pace. Guides will be sent to ticketholders via postal mail beginning late March 2013. All pictures taken are for personal use only. Please obtain written permission from individual garden owners before posting or publishing any photos. Docents help the Garden Tour hosts welcome tour attendees, validate tickets, and talk about the beauty, practicality and environmental benefits of gardening with California natives. One full-day commitment (9:45 a.m.–5:15 p.m. on either Saturday, April 6, or Sunday, April 7) and some knowledge of native plants are required. Docents are welcome to visit the gardens on the other day for free, and are invited to the garden host and docent thank-you party. To sign up or for more details, contact Volunteer Coordinator Andrew Chaves at [email protected]. Thank you! The Native Plant Garden Tour is an annual program of the Theodore Payne Foundation for Wild Flowers and Native Plants, Inc., a nonprofit organization established in 1960 to promote knowledge and appreciation of California’s native flora and our natural heritage. Our retail native plant nursery, bookstore, seed room, art gallery and education center are open year-round to the public. 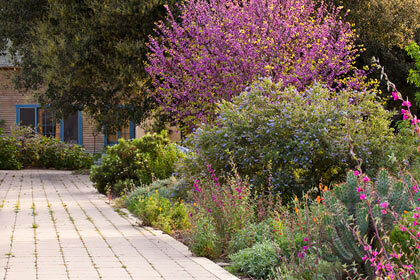 The nursery offers hundreds of different California native plants, helpful service and expert advice. TPF also offers classes and workshops for adults, and programs and field trips for children (K–12). Our 22-acre canyon site includes demonstration gardens, trails, a picnic area and colorful spring displays of California wildflowers. Visit us soon! If you have feedback or suggestions about the Tour, ideas for new gardens, or if you’d like to learn how to become a sponsor of next year’s Tour, please e-mail Tour Coordinator Margaret Oakley at [email protected]. We would love to hear from you!